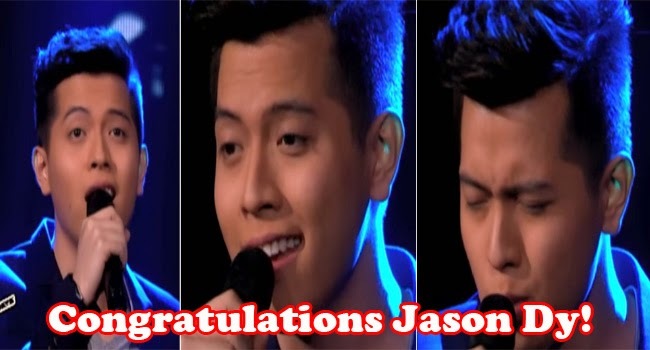 Jason Dy is finally named as the grand winner of The Voice of the Philippines Season 2 on March 1, 2015. After a long musical journey The Voice finally ends, hailing the winner as the newest artist who have what it takes to be an idolized artist. The winner not only takes home a Camella house worth 2 million, but also j JVC entertainment package, business package of 1 million pesos from Brothers, from Jag is a shopping spree and an Asian tour , a Ford worth 1 millions pesos, a recording and managing contract of MCA Music and a 1 million cash. Five minutes after the Voting lines were finally closed for the last time, the results had been read. Garnering 52.94 percent of the public votes, Jason’s name had been announced. With tears in their eyes, Sarah and Jason thanked the public for the votes. Jason praised God for making him win the competition. His mother joined him while they shake hands with the sponsors. With emotions, he once again sung his final piece ‘Minsan Lang Kita IIbigin’, in the midst of cheers from the audience. Even at the beginning of the competition, Jason was able to show that he can swoon the hearts of many with his heartfelt songs. Singing ‘Stay With Me’, during the Blinds Audition, he was able to convince Sarah, Lea and Apl to press their big red buttons. As it can be remembered, Lea seemed to have melted and even went to Sarah’s seat to hold her tight. They were both joined by Apl and the three had formed a group hug, unable to take the smoothness and sweetness of his song. Lea said that she was swayed by emotions just by listening to him sing that it was too much for her she even needed to touch Sarah to bare it. In the end he had chosen Sarah to be his coach through out the competition. Sarah helped him reach his dream to win The Voice grand title. His new journey had started as the old one draws to a close tonight.